In 1829, estranged from her family and living in an isolated Scottish village, Georgiana Kennedy made a sudden decision to marry Captain John Molloy of the Rifle Brigade, a handsome hero with a mysterious past. They emigrated immediately to the remote southwest of Western Australia with the first small group of European settlers, and experienced great hardship in the fledgling colonies of Augusta and Busselton. In times of personal tragedy and privation, botany was Georgiana Molloy’s salvation. She was self-taught and became the first internationally successful female botanist in WA. Her collections of the indigenous flora of the southwest include type specimens, archived today in the world’s leading herbaria. Georgiana’s story began twenty-four years before she sailed for Perth, in the wild borders between England and Scotland. The Mind that Shines draws on primary sources and fresh evidence to explore previously undisclosed influences that shaped Georgiana’s strong values and attitudes, shedding new light on her writing, and answers questions asked for a hundred and fifty years about John Molloy’s complete history and his influence on her life. This minutely researched biography covers some of the most dramatic scenery, geographical and historical, of two centuries in England, Scotland, Spain and Australia, exposing a tale of love, drama, adventure and resilience. 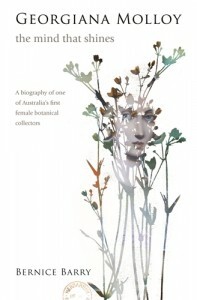 The author’s personal insights into her ten years of research into Georgiana Molloy’s life are threaded through the historical narrative, revealing a quest that anyone interested in genealogy will respond to: the excitement of discovering our origins and the significance of those revelations on our lives.